After much procrastination, I've decided that I'm relocating this blog to my website. I've had many happy years with Blogspot, but the time feels right to merge my two online spaces - it might encourage me to actually update my website...! The archives will stay here and be available for eternity, I suspect. Thank you for following and supporting me for so long. This blog was the first online identity for my work and it has been precious. Permit me to introduce you to LE-MERIDIAN FUNDING SERVICES. We are directly into pure loan and project(s) financing in terms of investment. We provide financing solutions to private/companies seeking access to funds in the capital markets i.e. oil and gas, real estate, renewable energy, Pharmaceuticals, Health Care, transportation, construction, hotels and etc. We can finance up to the amount of $900,000,000.000 (Nine Hundred Million Dollars) in any region of the world as long as our 1.9% ROI can be guaranteed on the projects. Hello! Thank you in advance if you are leaving a comment! If you leave your email address, you might get a nice reply from me! I'm an aspiring British ceramic designer who ran away to Australia with her paintbrushes and fell in love. 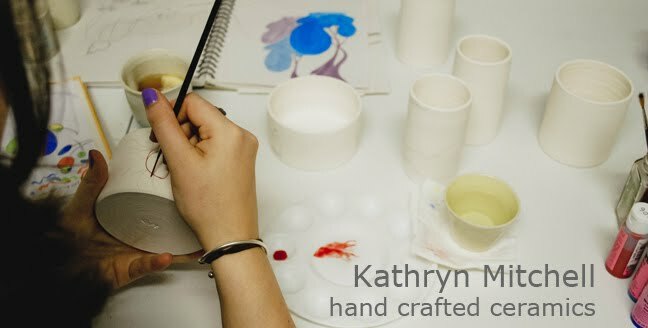 All artworks are copyright Kathryn Mitchell. If you would like to use one of my images, please ask. If you admire my work, please don't soullessly imitate it.